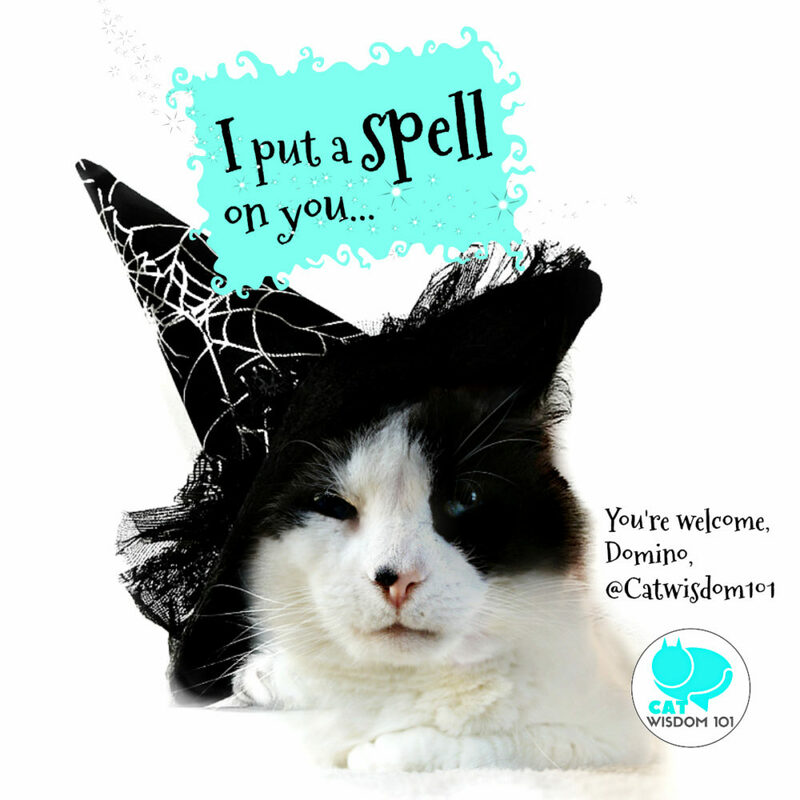 Are Cats Your Halloween Spirit Animal? Hello dear ones. Can you believe this is my last blog post for October? The entire fur gang is here today and we’d like to say we are doing purr therapy bigtime on Layla. She is humbled by the messages of condolence for her mom and truly the kindness of strangers connecting with her. 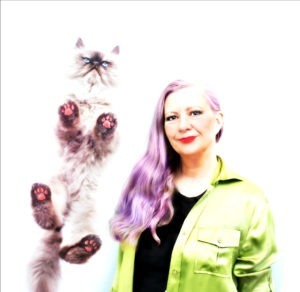 Readers with elderly parents resonated with the cat mom post facing the next phase of their lives. Tomorrow is Halloween. It’s a powerfully transitional time marking the beginning of winter, the ancient pagan new year Samhain and All Souls’ Day, Dia de los Muertos to honor our ancestors, all this week. Regardless of spiritual or religious affiliation, nature has a wisdom of its own. The days are growing shorter and colder in the Northern hemisphere. Leaves are falling. The wheel of the year has turned and it’s the season to go inward and reflect, to cozy up to your cat and a cup of hot cider or cocoa. We’re wild about Halloween and it seems like cats on Instagram and across the Internet are all dressing up. This is all new to me since I was in a shelter cage this time last year. Apparently, Halloween is a big deal. Retail spending is expected to hit 9.2 billion in the U.S. That’s a lot of catnip candy corn! Wait until you see my transformation. We all have spirit animals and more than one. They are also called power animal or animal totems. Witches’ cats are called familiars. Whatever you’d like to call them, they are there to help and guide you to your inner wisdom. Simply spotting a certain animal one day can be a messenger but not necessarily your spirit animal. You can’t pick spirit animals willy nilly. They choose us and you can take a fun quiz to find out your Halloween spirit animal. Sometimes the Halloween costume you choose for you or your pet might indicate a favorite animal. Before you see our sneak peek Halloween finery, we’d like to announce the final winner of our Black Cat Awareness Month costume photo contest via our BlackCatsofIG Instagram community. There were so many to choose from the simple flower crown in Autumnal colors won my heart. She’s pretty and pretty nice too. 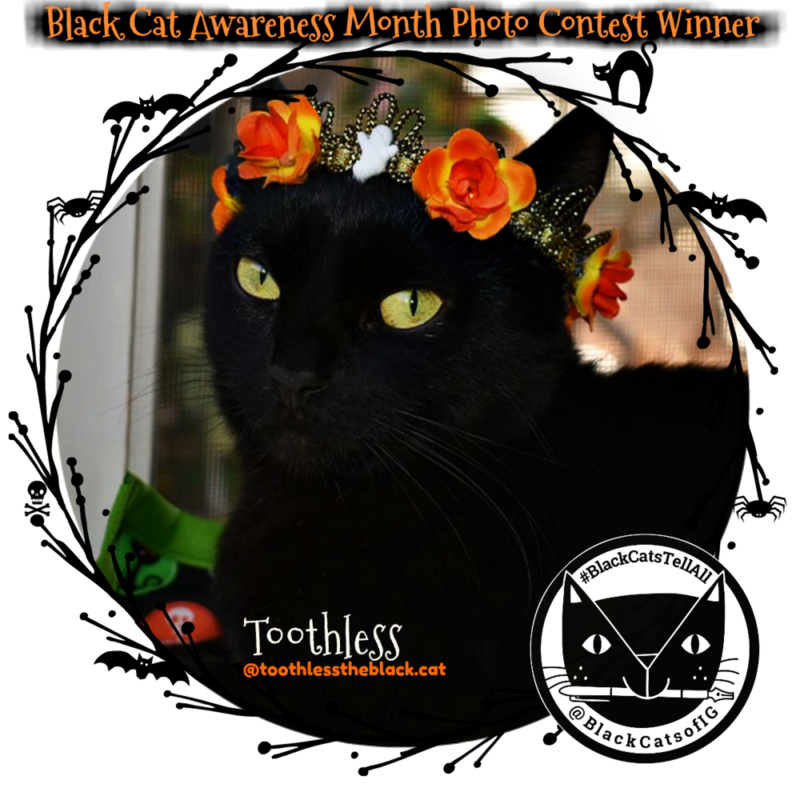 Congrats to the lovely Toothless who lives in sunny California with another black cat Bagheera. They are going to loads of Halloween parties for cats so visit them @toothlesstheblack.cat and join some pawties or like all the creative costumes. I bet you’d never guess inside this old black cat boy lives an ageless peace, love and rainbows unicorn. Yes, it’s me, Clyde. Never judge a cat or book by its cover. Magic pop up when we least expect it. Do tell us what Halloween costumes are in your future? 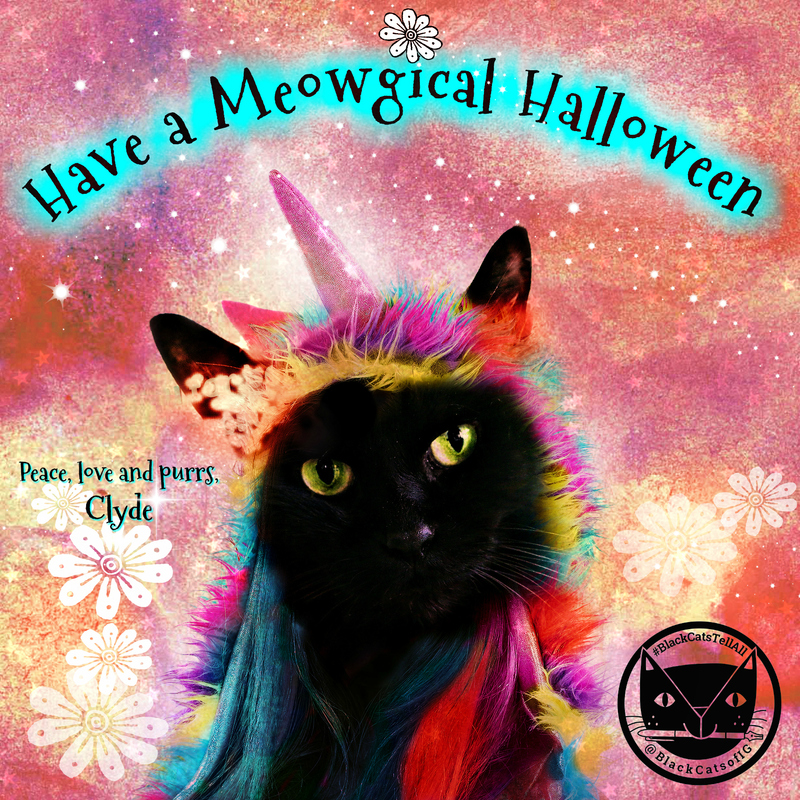 On behalf of all of us at Cat Wisdom 101, have Meowgical Halloween! 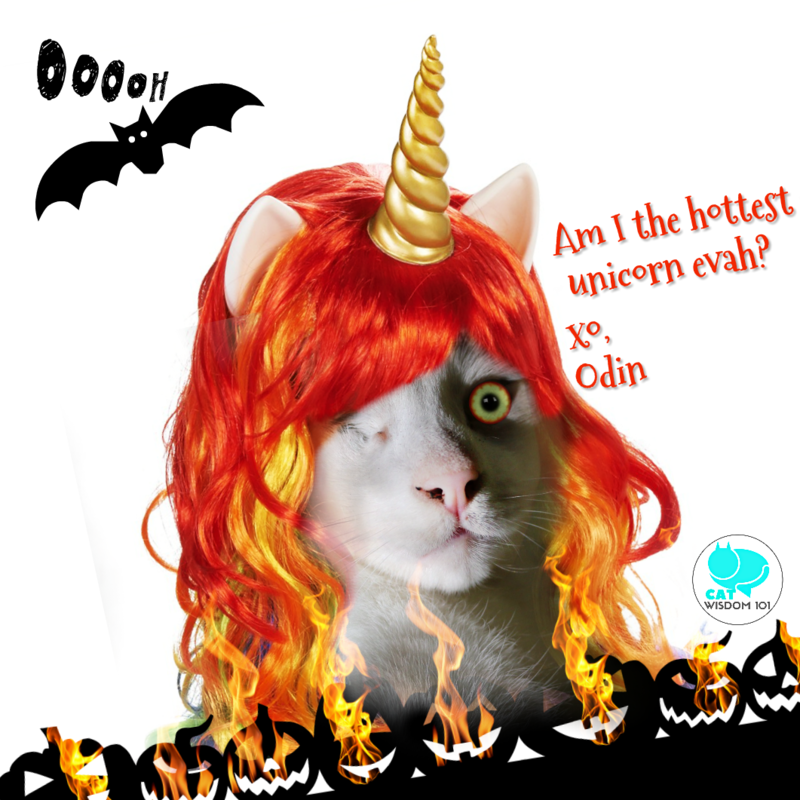 Who knew Odin could rock a unicorn horn? He’s always full of surprises. Domino would not be caught dead wearing a unicorn outfit. He’s way too badass for rainbows and frou frou. He’s more of a wizard and watch out, he might put a spell on you! Nou Nou has gone to the dark side to channel her inner Frida Kahlo or Katlo, the iconic Mexican artist who died in 1954 and enjoying a cultural resurgence. I’ll immediately grab your rss as I can’t to find your email subscription link or e-newsletter service. Do you’ve any? Please let me know so that I could subscribe. Thanks. Oh Clyde this is a beautiful post. I love the pictures! Well done the Black Cat Crew AND Toothless!! This is an incredible celebration of cats, black cats, Halloween, life and death. I’m still reeling with love and wistfulness, thinking so much about your mother, Layla. I can’t get over how wonderful she is and was, and how recently — days — this was. OMC! You guys all look pawsome for Halloween! Have a great one! I was a turtle- odd but true. I think because i was so indecisive on answers. Who knows. Happy Halloween to the gang! Toothless is beautiful. I must say the mancats are dressed nicely too. Not doing much here, I dont do a lot for Halloween these days > I look at it as a transition. I need to go pagan to me it is a fall festival. *hugs* Layla, you are in my thoughts as always. I’m a turtle too for water element animals. This season is about transition. Turtles are awesome. They are from the water element which resonates with Scorpio and we can have totems from all the elements. We totally dig the costumes guys!!! 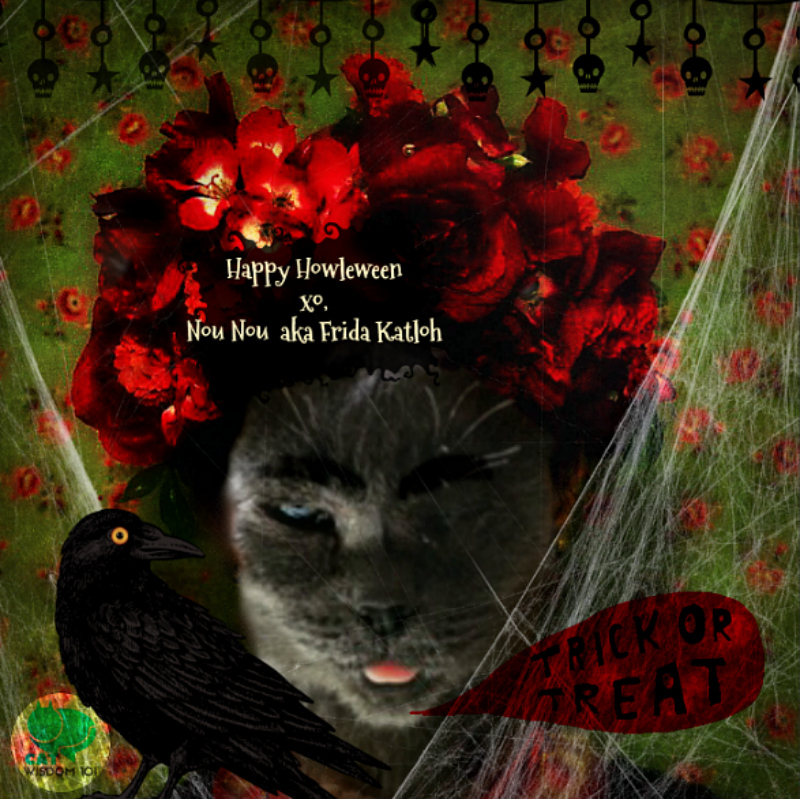 We hope everyone has a safe and happy Meowlloween!!!! Black Cats look so cool in costume! Thank you. I must say black goes with everything. Halloween is not a big deal around here… although we do seem to have accumulated a lot of decorations! But it will be quiet at our house tomorrow, with the porch lights off and no visitors. 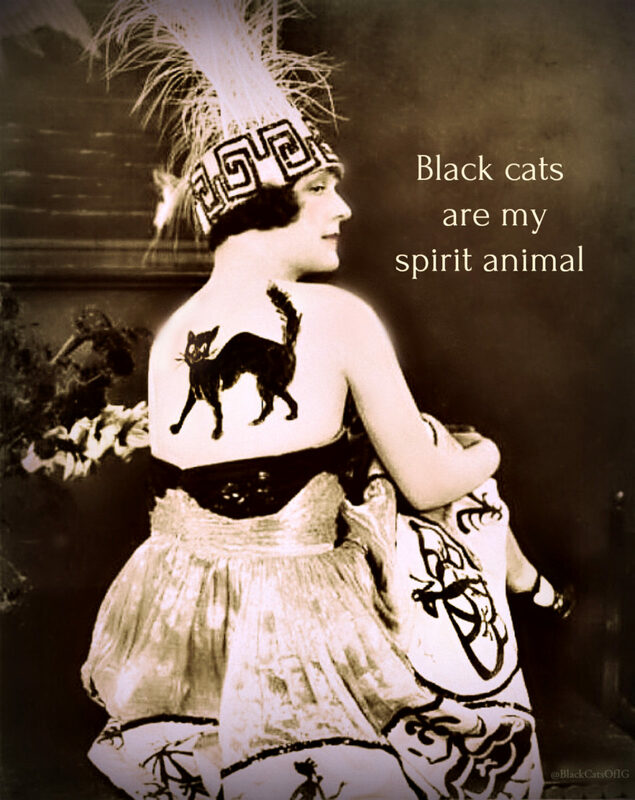 If we celebrate anything, it will be the awesomeness of black cats. Purrs to you. What a delightful post! Toothless is beautiful. Kisses for sweet Clyde. Thinking of you Layla, and sending my best comforting wishes for peace and health.